A second doctor who treated Baby P has been suspended by the General Medical Council (GMC), the BBC has learned. Dr Jerome Ikwueke, a GP, saw the boy 14 times before his death in Haringey, north London, in August 2007. The child had suffered more than 50 injuries. The GMC's Interim Orders Panel has suspended Dr Ikwueke for 18 months. In August Dr Sabah al-Zayyat, the consultant paediatrician who failed to spot the boy's broken back before his death, was suspended for 18 months. The panel imposed the 18-month suspension on Dr Ikwueke on Tuesday and said the action would be reviewed after six months. The doctor had twice referred the toddler to hospital specialists after becoming concerned about suspicious marks on his face and body. Although the panel is currently investigating both the doctors no suspension hearing date has been set. The Healthcare Commission is due to publish its report into the NHS handling of the Baby P case next week. 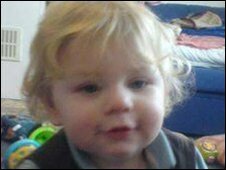 Baby P's mother had pleaded guilty while her boyfriend and lodger Jason Owen, were convicted in November of causing the death of the boy. The death of the 17-month-old led to the sacking of Haringey's head of children's services. When Baby P died he was on the child protection register and was seen by professionals 60 times. Following the verdict Children's Minister Ed Balls ordered an inquiry into the role of the local authority, the health authority and the police in the case of Baby P.